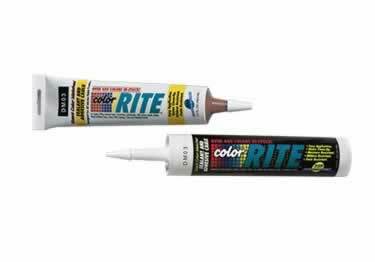 Color Rite Sealant and Caulk Adhesive comes in 120 standard Johnsonite colors. It''s mold and mildew resistant and easy to apply. Great for interior or exterior use on flooring applications, cabinetry, countertops, kitchen and bath fixtures, exterior molding, siding, and more. Caulk Gun: Durable all-steel construction, smooth continuous feed and pressure delivered by pushrod, Easy-access thumb lever releases rod pressure for reloading or for stopping the flow. Can this be used outside in sidwalk joints? My hardwood installer sent me a picture of his tube of Color Rite to fix chips & scratches in my floor. He said to order a tube. The label on the tube says color BA13. Can ou tell me what color I should order that has that code on it? Great finishing touch to my project. This product was a perfect match for Johnsonite Sandalwood #45. We did some stair and risers and needed to caulk a couple of spots and this was exactly what I was looking for to complete a great installation job. I will definitely order this color rite caulk product again!